In this tutorial we will guide you through the process of using your own nameservers. First you must create the A records for the nameservers, activate the nameservers, then assigning them in the Web Host Manager (WHM). Then going forward, when you create a new cPanel, it will use the default nameservers. This will not change the nameservers for existing cPanel accounts. They will have to Update their nameservers to the new ones, with their registrar. Under Domains select Zone Editor and then + A Record. Older cPanels will use the Advanced DNS Zone Editor instead. 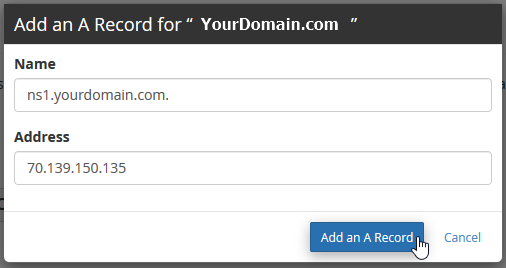 In Advanced Zone Editor, in the Add a Record section, fill in the fields as needed for each nameserver you want to create. Below is a brief example of what to enter in the fields. For Zone Editor, simply add the name and IP address. After filling in the fields, click the Add Record button. You may see a message stating Added record. At this point you must activate or glue your new nameservers with your registrar. If your domain is registered through InMotion Hosting, proceed to the next section. Most Registrars will have a section similar to Maintain name servers under this domain, or it's sometimes referred to as glue, or host records as well. Typically you'll just need to enter in the part before your domain name ns1 for instance, and then your shared IP address. 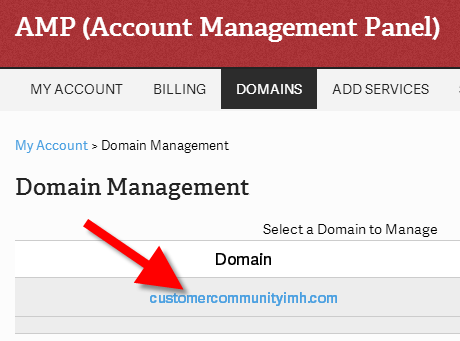 If your domain is register through us, you can activate (also knows as glue) your Custom Nameserversin AMP. Do you need more control of the resources for your Reseller account? New to Reseller hosting? Check out the Reseller Hosting solutions provided by InMotion Hosting! 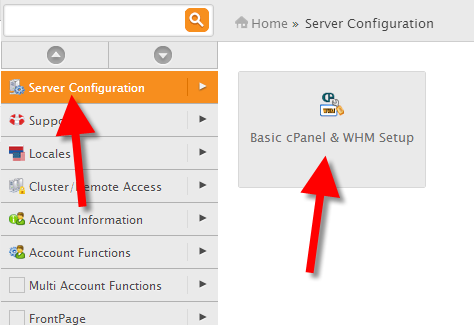 In the left navigation menu, click Server Configuration, then click the Basic cPanel & WHM Setup. You will then see the current nameserver assignments. Enter your new nameservers, and click the Save Changes button. You will then see a message stating Your account's nameservers have been set to ns1.example.com and ns2.example.com.This system has no free IPs. Remember, any DNS modification such as a Nameserver change can take up to 24 hours to propagate. Congratulations, now you know how to use custom nameserver as a reseller! In normal cases usually, we have 2 private nameservers which point to the same IP. I want to use multiple VPS under a single domain. Actually, I have two different VPS one with inmotion hosting and the other one with Bluehost. 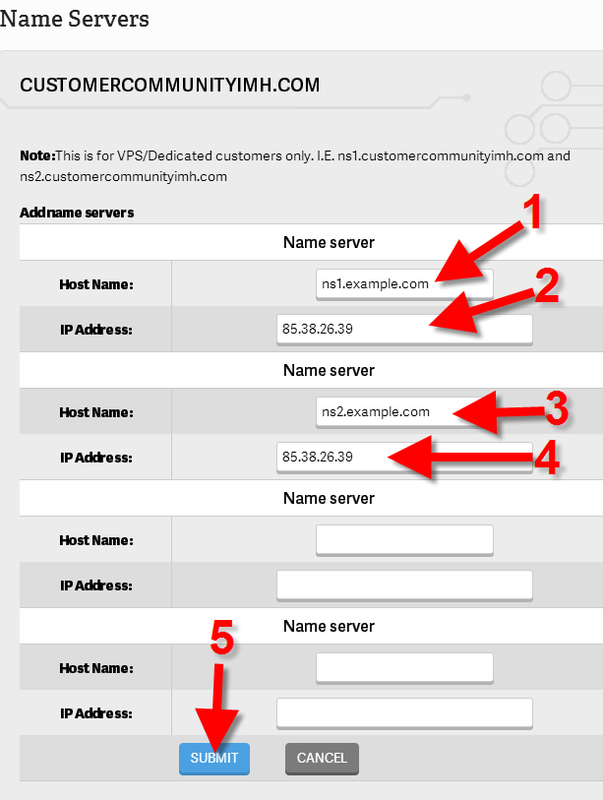 I'm using inmotion with ns1.example.com and ns2.example.com which works fine.Now I add two more glue records under my same domain with ns3.example.com and ns4.example.com which point to the Bluehost VPS IP. If I add the ns3 and ns4 which point to the Bluehost, will it work??? Unfortunately, that solution will not function as expected. You would essentially be bounced around between both servers randomly using the one domain. Can i use private nameservers for the initial domain i register the reseller account with, or are the private nameservers only for future domains registered by clients? If yes, do i have to remove your info in the WHM Edit DNS Zone and change it to my main accounts domain info? Such as your SOA and your nameservers. To answer your first question, yes, nameservers can be applied to new and existing domains. And the ability to edit a DNS zone and edit SOA is available in shared reseller plans. I followed the instuctions above(which could use some updating) and the dns seems to be functioning but has some errors when checking with a dns checker tool. I am getting this error: "Local NS list does not match Parent NS list"
The local nameservers are still pointing to ns1.servconfig.com and ns2.servconfig.com. 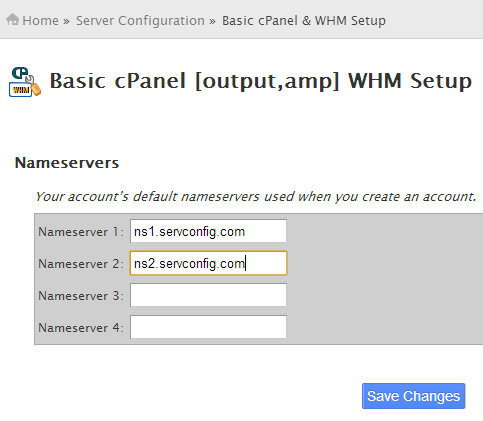 I've changed the nameservers in WHM but my "main domain" is not listed in WHM nor can I add it. Is this due to it being my "main domain" for my reseller package? Is it manditory to keep my "main domain" pointed to the inMotion nameservers? Thanks for the question about your name servers with your Reseller account and for your recommendation on updating the article. The change you're trying to apply does depend on the Reseller account type that you're using. If you're on a shared server Reseller account (as opposed to a VPS Reseller), then you will have only limited options available to you through WHM. If you want further and immediate assistance, I recommend contacting our live technical support team and they can help guide you through any needed changes. I have a reseller hosting for domain_a.com at InMotion. The registrar of it is hexonet.net. I created my own nameservers of ns1.domain_b.com and ns2.domain_b.com at namecheap.com. Now, is it possible to point domain_a.com to the reseller hosting at InMotion by using nameservers of ns1.domain_b.com and ns2.domain_b.com instead of ns1.servconfig.com and ns2.servconfig.com? InMotion Hosting Reseller domain domain_a.com should be pointed to ns1.servconfig.com and ns2.servconfig.com. Unless custom nameservers are configured, for domain_a.com, in which case domain_a.com would point to ns1.domain_a.com and ns2.domain_a.com. However, since you want to use the nameservers you created ns1.domain_b.com and ns2.domain_b.com, you would need to conifgure the DNS necessary for domain_a.com to point it to InMotion in those nameservers DNS management system. You would lose the ability to maintain the DNS from cPanel/WHM (at InMotion) in this case but it is possible to do this. Now question is: I have InMotion reseller account and I want to use those custom nemaservers. What changes I have to do to DNS records so I can use those custom nameservers? If you are not able to use the directions in this article to create your custom name servers, then please contact our live technical support team. They can help direct you on what needs to be done. Changes needed for DNS are provided in the directions above. I have a reseller account, and i have created a cpanel for one client and the nameservers are default nameservers, But if i want change dns to my custom dns. Does the default old DNS work for first client ? You can use those nameservers or the custom ones that you setup as per this article. Hi, I have a reseller account and I want to change my nameserver. I did not setup any websites till now but when I do, I want my customers to use my domain name as their nameserver. So, if I follow these steps, all the future nameservers will be this?? Yes, once you set your custom nameservers up as described above, your customers will be able to point to them and use them to resolve to your server. My domain is registered at 1and1. It will not allow me to use my shared IP twice when registering custom nameservers, has to be 2 different ips. Can I just use the second assigned IP. My shared is actually a dedicated on a reseller account. Hi I do not speak English and I hope I understand :)I followed the tutorial step by step, and made the necessary changes in CPanel and WHM, but my Registrar asks me two shared IP and only have one, just accept me for NS1 and a different one for NS2, not accept me the same for both NS, where I get the other IP Shared? You can use the same IP for both. See the above steps under heading "Activating Name Servers with your Registrar". I created nameserver ns1.365websitehosting.com and ns2.365websitehosting.com. This has saved very well but when I am pointing my actual site in godaddy using edit name server. It is saying "You must enter a registered nameserver." Please note 365websitehosting.com is my main site which I will be operating my reseller activities from. You may need to register the nameserver with GoDaddy. Content them to see the process to register your nameserver. I created custom nameservers for my reseller account. when I do test account in WHMCS this all works fine with the new account I create for my test customers. But I see that my OWN nameservers still show as "serverconfig" name servers. So I would like my own to be custom nameservers too, but I am not sure if I need to create ANOTHER set of custom nameservers for myself, or follow a different route for this? You should just need to point the domain to your custom name servers that you have created. I followed every step and it doesn't work. Thank you for contacting us. Remember, any DNS modification such as a Nameserver change can take up to 24 hours to propagate. Ensure you have "activated" or "glued" the record with your registrar. If you can provide the nameservers you are setting up, we can test further. I created the name servers based on lara.ca in my regsitrar. This is the result when I do a DNS look up. I was able to point lara.ca to ns1.lara.ca and ns2.lara.ca but I cannot point other domain names to the custom name servers. I've had this setup for over a week now and still not working. You may want to contact the registrar for lara.ca as when I look up the DNS for your custom name servers I am getting the following IOP: 64.235.96.162 and not 173.247.251.164. So I did the DNS look up above and I did not see the IP (64.235.96.162) that you mention. Can you post a link of how you did the look up? I thought this was going to be an easy thing to do with inmotionhosting but obviously its not. I am seeing ns1.lara.ca 173.247.251.164 and ns2.lara.ca 173.247.251.164 when I do a WHOIS on your domain. I do not see the 64.235.96.162 IP address anywhere. Custom Nameserver Error: "You must enter a registered nameserver"
For anyone with GoDaddy as your registrar, this can be a bit confusing. Instead of going straight to "Set Namesevers" (which seems logical) you must first go to "Manage DNS", then the "Settings" tab and scroll down to "Host Names" in order to complete Step 3. in the "Activating Name Servers with your Registrar" of this tutorial.. If it shows 0 hostnames created, click manage to follow Step 3. (only add ns1 under your first hostname, not the url portion) then add your shared IP under "Host IP Addresses") Go back and complete for ns2 as well... same shared IP. THEN you can return to your domain listings page, and select "Set Nameservers" to add ns1.customdomain.com & ns2.customdomain.com as your custom nameservers. I hope this helps someone. It may be obvious to some, but some of us are just learning the in's and out's here... even GoDaddy was at a loss when I called with this error and I was left on my own to resolve this. Reseller Hosting and I want to set my own nameserver and i have 2 questions for you. 1. How many times i have to Add Record? Is´t ok if i put only 1 time or not? 2. Does this make any effect on my website that i transfer to inmotionhosting few days ago if I change my nameserver? Thank you for contacting us. You should be able to just create one custom nameserver (since they are both going to the same IP address), but typically you would use two. This should not result in any downtime. But, be sure to allow some time for the new nameservers to propagate before pointing to them. I have one more question. Should I write ns3.servconfig.com and ns4.servconfig.com to point a second domains from same registerer to Inmotionhosting or should I write same for all ns1.servconfig.com and ns2.servconfig.com for all? They would all be the same (ns1 and ns2). In first part (Creating A Name record), you only say to create record for ns1. What do I do for ns2? Which IP address do I use? The same IP as ns1??? Do I have to purchase another IP for ns2??? Our example did not mean to only create just ns1. You will need at least 2 different nameserver subdomains, usually ns1 and ns2. For the second one, you will not need a second IP address. Simply using the same IP as the first one should suffice. Before you responded, I expremented with using Inmotion's RESELLER nameserver IP: 216.194.168.112 (ns1.servconfig.com) and 70.39.146.236 (ns2.servconfig.com) as the IP for my own custom ns1/ns2 nameservers (as an "A" record). It worked. But, am I suppose to use my own SHARED IP described in step 1 for my custom ns1/ns2 nameservers? Is that suppose to be best practice? Yes, the Shared IP is the one you'll want to use. Your nameservers returned different nameserver records. Unfortunately the comment is not relevant to the article topic, which is how to set up custom name servers. If you would like, we can support your question through the Ask A Question tool. This is so we can keep relevant content together for search purposes so others with your problem can also find help. Okay. A little bit confused. All of the above makes perfect sense to a complete newbie like me. You're creating a branded name and pointing it to inmotionhosting IP so that anyone who uses it gets taken to the IP here where it's directed to the appropriate place. Are they talking about giving the same namservers setup in the above article a whole lot of additional IPs to go to (and a LOT of IPs at that)? That article is basically doing the same thing, but they just use more subdomains (ns1, ns2, ns3, ns4) and point to individual IPs instead of a single IP. Those IPs would all need to be set up on the server and then each subdomain points to an individual IP. Our method uses just two subdomains and points them to the same IP. But what about when I've followed the instructions above and have ns1.yourdomain.com pointed inmotionhosing's IP, but I also want to sell domains, so I go to Resellerclub, and they tell me to fully brand I should point that same thing "ns1.yourdomain.com" to their choice of IP? Can it be pointing to both? or are they expecting me to choose something unused like ns5? When you create your nameservers, you can create as many as you like, but you want all the IPs involved to be on the same server. I'm trying to brand my nameservers on Godaddy. I created an A record for both ns1 & ns2 with the shared ip, but when I try to edit the nameservers on Godaddy, I keep coming up with "You must enter a registered nameserver." I'm not sure what the heck I could be doing wrong. In some cases you need to contact Godaddy themselves to have them add it. Also please make sure that the nameserver is resolving to the IP address you have set it too prior to change the name servers as it may fail if the system can not access the domain. I have a reseller account and created the A records the other day, I got the same error the other day as well. Apologies for the problem with DNS. If it's still not working, we do need to have more information on your account. Can you please provide a domain name or user name so that we can investigate the issue? If you want to keep the matter private (as posts on the Support Center are public), then please contact our live technical support team via phone/email/chat (contact info is at the bottom of the page). Can I used vanity NS and Custom NS at the same time, in order to get good enough redundancy? Thanks for the question! We actually have an article on the Vanity name server. It's not really necessary to have both and it does not give you any advantage to use both. So our suggestion is to use one or the other. Please read through our documentation for more details on either name server type. If you would like to have name server redundancy, you could follow the steps in our vanity name servers guide to set this up. Then you'd want to follow the other steps in this article about activating your name servers at your domain Registrar, and then assigning those name servers in WHM for your reseller account. If you had any other questions at all, please let us know! According to this instructions both of the record point to the same IP address so there is no redundancy if using the custom name server option which is not good. Is there any way to have custom name servers with Inmotion and maintain redundancy? 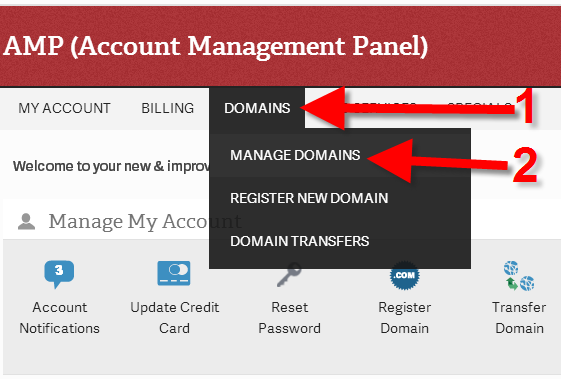 If you have created your custom nameservers, you will still need to re-point your domains to them. If you have already pointed your domain to the custom nameservers at your registrar, but a whois lookup is still showing old information, you would need to contact your registrar as something may have not updated correctly. It sounds like the system is either not seeing your newly created entries, or that they were not created correctly. I see a note on your account from just a bit ago stating we had to clear out old DNS entries for you. Are you still having any issues at all? I've followed all the steps. "ERROR: This is not a valid entry, please resubmit."